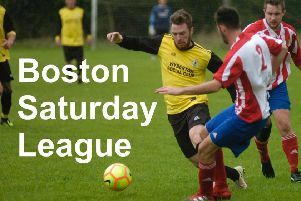 Weather played a key role as Coningsby welcomed Heckington Millers on Saturday for a rescheduled league match, their penultimate of the season. The game started off in warm, spring sunshine but this was not to last. The Millers seemed equipped with faster legs but the Reds adapted their play to match and goal chances came and went for half an hour with nothing ending up on the score sheet. Then, seeing his chance, Jamie Todd made a trademark long, solo run and chipped the ball over the head of the advancing ‘keeper for Coningsby’s first goal of the game. Cue torrential rain. Shortly after this sudden change in conditions the Coningsby goalie, Andy Carr, somehow got entangled with Mark Wheatley and slipped to the now sodden ground leaving the goalmouth empty and inviting. The Millers were quick to accept the invitation and make the honours even, a state of affairs that lasted to the break. The second half started just as the clouds cleared for another spell of sunshine and eight minutes later Coningsby’s Mark Maddison cleanly headed in a corner ball putting the home team in the lead once more. With 15 minutes left to play and the with the rain returning Andy Carr caught a long volley only to drop the now slippery ball, which was duly despatched by the Heckington follow up. Coningsby now face Swineshead Institute in the Willoughby Cup Final on Thursday evening at Boston’s Tattershall Road ground.